Originally uploaded by Mistress B. 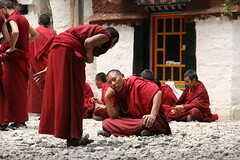 Every afternoon, the monks of Sera monastery gather in the courtyard for a debating session, but it's debating like I've never seen. The arguers (the standing monks) punctuate their arguments with regular loud slaps on his palm and the really enthusiastic ones even get a run up by lifting their front foot off the ground pre-slap. 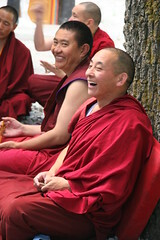 It's a great show - the courtyard resounds with slaps like gunshots, but even funnier is watching the facial expressions of the monks as they make their points. They always debate religious subjects, and it's usually a one-on-one affair. It reminded me of Matty (my brother) and his many attempts to engage the rest of the family in intellectual debate. But he usually lost out to the television (or dinner) in the end. Matty, you would have been in your element here!